Not only Russia, but also Belarus were added in to this version with the original Europe map. Ukraine will be added in the next version! I have been driving this map for about 24 hour’s now, and I found this map to be very nice. Very nice in deed, I also liked the idea of driving to Moscow or “Mockba” to the Russian player’s out there. I did find a few minor issues with the map, like road sections that didn’t quite match up, some rough ness in the road minor stuff like that. I also found that the time seemed to move slower in this map. I did 4 quick jobs, where in the regular game you could do 2 and the sun would come up. I found that very interesting. So that was interesting to me, night seemed to go slower, I am not really sure if it was an accident or if the developers meant it to be that way. Now to the core of the matter. This is a stand alone map. it will not work with the core game, so you will have to start a new Profile. I had a couple of mod conflict’s in the game, I had to run this game with out any mods going. I will keep running this map to find out what was the problems and I will leave an update on a later date. It is my opinion that this will be a great map, I feel that if the development team can get the miner fixed then this will be a really nice map to drive. To the Eastern Express map team, I say congrats to you. Keep up the good work! Note: You need both Going East and Scandinavia DLCs for this map to work. I tried this map a little while ago and I found it to be a real nice map. I was asked if I would go back and do an other look at the updated version. So that’s what I have done. But this time I decided to keep going to find snow, like it day’s in the description. I found snow, but I had to go into the far northern part of Russia to find it. When I did, my truck really had to work to drive in it. I have driven in snow in real life, so driving in snow in this game was a real treat. I did how ever find a couple of bugs in this map, I hope they will get fixed in a new update. I will recommend this map to any one that wants to try it. I found this map to be Challenging in places and I found it to be easy in others. This map is very well done and it is worth the download. Have fun all. Added plenty of difficult roads. Real logos for companies and gas stations. Traffic lights in Belarus and Russia have a flashing green light. Time to deliver goods was increased. Fixed HDR for better display graphics. Download this map and the Add-on. Run game ~> Create new profile ~> Enable all those scs files. Chose europe.mdb in the module section. I’ll test it for you on 1.11 – I will let you know if it works with 1.11 🙂 Thank you. I can run it smoothly on 1.11. Thank you mate, great words! Hello. I am Currently playing with this map. Just as @Bobbo662:disqus has said, I also can only play on the Russian part of the map. I am unable to connect the rest of Europe to Russia. So far, I’ve seen a couple bugs: At some garages, that you may buy, some of the objects that sits around the garage is now sitting in the street also, I’ve stopped at a couple of toll booths, & the texture is missing from the toll booth structures. Other than that, so far, so good. Still, I would like to see all of Europe & Russia combined as 1 map. I think the previous version of this map didn’t have this problem. Is It Compatible with the latest TSM Map? is the promod 1.71 compabile with poland map and dlc east? Still crashing on 1.12 with no other mods installed. I’ll try disabling the “more traffic” mod, but that comes in the same package as the map itself, so there’s no reason it shoud be crashing. Have you enabled the map and its own add-on? New version will be out soon :). might be a problem with some mods. ive been playing this for a few hours now , and looks sollid but now ive just got my first load to deliver way up north , i think its syberia but my truck wont accelerate decently in the snow and i cant get over the hills .anyone else having problems with this ? or suggestions ? For driving through Snow you MUST select manual gears, personally i use 3 Trucks (different IDs ) ones a Ural with a 750hp 3,500nm engine, ones a Kamas with a 780hp 4,000nm engine and the last one is a Daf High lift crawler running an 1000hp 4,500nm beast, (8 driven wheels and flotation tyres) all will cruise at 70kms in 8-9th gear, keep at it and all will be fine but auto gearbox setting will not work, its an ETS transmission script problem, not the map per sec, love it for its challenges 🙂 . Here is a collection of runs that were started & finished in different parts of the map. So far, they average between 500km close to 3400km runs. Some runs may look familiar from the previous version(s) of the map while some runs take place in the new additions of the map. I will say ahead of time, so runs are nice & calm & others, well lets just say my old driving style has come back with a vengeance. I had a few crashes to desktop, In my game, at certain or close to certain depots, the frames per seconds will slow to the point of crashing the game. Resetting will get you through that problem. (I left times that the game has crashed in the videos so you can get an idea) Also, at times, the game or what’s going on in the map causes micro stutters to the point it looks like the game would freeze & crash. There’s a few bugs here & there, (you’ll see some in the videos too) & I will CONFIRM, there are hidden roads in the map AND they DON’T show up on the GPS/Route finder. In some runs, I’ve found a few & decided to drive on them. I think it’s worth it. You never know what may be on those roads or if it gets you to your destination faster or not. This may help(or not)…. be careful in picking which mods to activate in a v1.14 map. I think alot of the trailer/cargo mods may not be ready for v1.14 & may increase the chance for the game to crash more. I played this map with both the regular ETS2 map and this one connected. I just focused all my runs in the East Express part to give an idea of what to expect in many parts of this map. I’m not sure why but, unlike some other people, I haven’t had a problem with the map zoom. Of course, once again(as you see in the videos) there’s 1 AI mod that I love to use that it seems no matter how much the AI’s improved, this mod will always throw a wrench in the works. But, it’s soooo much fun trying to figure a way out of the mess. Like I said before, some runs are relaxed, & some runs, I just went crazy. So, if this comment gets posted, (I know it’s running a bit long) take some time, watch one or two, maybe all (if it’s possible) & you’ll get an idea of what’s in the map to explore. Enjoy. I have added some of your videos into the post. I has eastern express 3.5 and I went to northern Russia and there was snow on road. With 350hp Volvo, I failed, had to cancel. But with a 750 hp Volvo later, I could drive, though I should admit that it was 20-30 km/h max speed while the AI trucks were taking much heavier load of tanks etc and were driving as if in normal roads. Thanks for that. Ill try it when I get to that stage. Im still only 500 engines. Yes, no automatic, go for sequential gear which gives you more control. Im using a game pad at the moment to complicated to have geers. Dont have that many buttons. Ok. Don’t want to bug but in PC keyboard, I use Shift to gear up and Ctrl to gear down. Might be similar in your settings, hope you find out! Hopefully the Map maker will add a picture file showing the actual area sometime as you cannot see the vast majority of it, other than that this is a very under-rated piece of work and I highly recommend that if you have not tried it and like challenges to download and give it a whirl, there are bugs, the major ones being the inability to see over 2/3rds of the map area, the second being the speed limits bugs, namely 30 – 50kms speed area, but no clearway after resulting in stupidly long un necessary slow drives, a temporary cure is to open your ets 2 folder in documents, select Profiles (the first one) and you will see all your ID`s (savegames), open each one and you will see a config file, open it with Notepad and scroll down untill you see “Police” it should be set to “1” (unless you have a no fines mod), delete and type “0” ) that`s a zero not oh, now save and hey presto no more Police fines and as its in the config and not a mod there will be no conflicts, hopefully the map maker will keep expanding this further and further. I have ets2 1.13.3, and I have downloaded this mod. I created a new profile and europe was selected by default. When I continued after company registration page, it took me to load/save game page and there were no save games, and it says “problem with loading the save”. I have other mods in folder but none selected. You said it is compatible? And in your filename also, its 01_eastern_express_ver_4_0_ets2_1_14.scs and 02_morozov_exp_3_6_ets2_1_14.scs. Can you tell? Can you give me your error file log? I downloaded the map, and I have to say it is a good map, but it’s let down by bugs for me. I come across houses placed in the middle of the road, I’ve come across areas in the snow where there is no road and my truck is there dangling and taking damage. The map creators have focused too much on quantity and not so much on quality. This map has a lot of potential, I love the massive distances between towns and the lengthy jobs, but unfortunately the bugs let it down, needs more polish. After entering Russia from Poland, I found that toll gates speed limit was not there, it was 110 km/h. And at some points, the game will stutter, and sometimes crash. Sometimes, when I go to Profiles by pausing driving, and edit a mod, add or remove, it will crash. So I have to restart the game again to remove or add the mod. If you still have 1.13, forget worrying about this map because this map is not released yet, its just a review. Get 1.14 ets2 and wait for the stable release of this map. Now, there are many roads that end to sky (nothing) and also sometimes crashes. So stop worrying and wait for stable release of this map for ets2 1.14.x. This map mod is one of the best map mods I ever explored, ranking up for me at #3. This is a very big, wide map mod, time is quite slower (does not affect my feeling about this game), get to travel far distances, and a pretty cool map. Winter at the northern part of the map, which was very interesting. Long distance roads made me a little boring, but the sceneries make me interested with my journey. Lots of cities and it’s one of the kind of map mods I used. Keep it up Eastern Express team! Thank you for this great news. I am looking for the download link. Hello. I don’t think Eastern Express v4.1 works with Promods v1.80. Please confirm that this comment, “Note: Eastern Express Map v4.1 works fine with Promods Map.” is correct. pro mod 1.8 ile çalışmıyor. 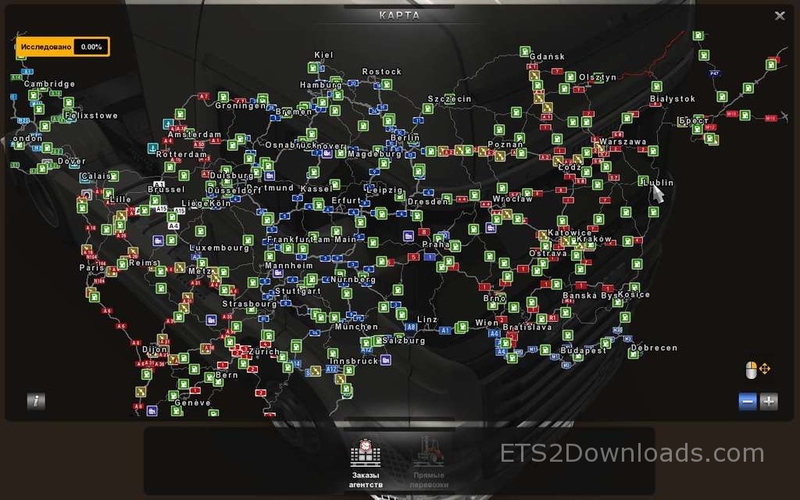 I have v1.14.2s – (Eastern Express Map v4.1+ProMods 1.8) NOT WORK! whats the difference between 4.0 and 4.1 ? This is a part of a collection of deliveries done in the new v4.1 update of the Eastern Express Map series. Thanks to Valera_T, Morozov & the others for all the time & effort that they put into each map & map addon. Right now, the only problem that I have is, as I past thru certain parts of the map, just like the last version, I’m getting a bit of lag or micro stutters more than usual. I don’t know, it could be my setup or the map. Once again, great map to play & explore in. Because when I remove it, I lose about 20 cities – garage ??? does it work with Going East DLC? there are certain parts of the map where you got to go against sense or make a return in a very narrow place especially when you got the mod of road hunters. but I wonder if there is any pack for tires for snow because the standard is almost impossible to reach Murmanks in M18-E105 route. There is also a section when it comes Petrozavodsk to Lublin by the M20-E95 highway, when one joins the A20 to the M20 indicates that the gps is enabled this road but in the game not this, then you should turn on and off to Moscow then go to Lublin. I have seen most of Jazzycat mods appeared in this game, so having my jazzcat mods in my mods would be useless to use. It does not seem to be compatible with most of the common other mods, esp. winter map & weather mods where in I have seen winter in the north of the map (except truck mods.) It works with graphic mods actually 😀 like Brutal environment X but unfortunately the map wouldn’t move to the map so probably have to disable it yet. It’s one of the biggest maps, like TSM map. Great features, lots of roads to explore. Winter can be seen in the north. Mods were all in one in this mod so it’s quite amazing! Moscow is a big city in the ETS2 map so glad to see it. Since from 5.0 none of the mods weren’t working anymore only to this mod since every mod has been combined in this map. There was also something in the internet ETS2 called the Orient Express Project, which so far it’s latest version is v3.8. Then here comes the eastern express map which its latest version is v5.0. The authors are the same. Somehow, Eastern Express Map has replaced Orient Express Map…. Here is my 2nd review. Cities were nice to explore with, nice structures and monuments. Some cities have airports and you get to undock your trailer inside the Antonov 225, though there are some parts of invisible walls in the aircraft, I’m still able to find my way into the Antonov 225 and undock my trailer there. Hope you don’t get board on a nice, straight, forested and long highway for a couple of minutes, anyways after that point you would be able to discover another kind of scenery and road and city. 0.05 more for Eastern Express Map haha. One of these days I will try both this map and Brazil. Really looking forward to the new things they will bring to the game. On the other hand…I dearly wish some of these mods teams would realize that we have a half dozen mods that change Europe. What we dearly need are mods to add to it, not redesign it – again. I appreciate the hard work; I do. But I also wish this mod could be used alongside ProMods, not instead of it. Just a thought. Drive safe. Hey dude, you know it says day’s instead of says, right? Delivered cargo in Krasnodar 4228km run. More information is in the video description. Thanks for the video buddy! Hello. Here’s a short delivery run completed with the version 8.2 map. This happening error loading the recording. I’m using ets 1:22, eastern express 8.2 and tsm 6.2 . If someone can help me thank you. whats the order for Eastern Express 8.2 + Promods 2.0 ??? It has an error in the connection between Marseille and montpellier. A7 and A9 highways. Guess someone updated the map mod to v1.23.